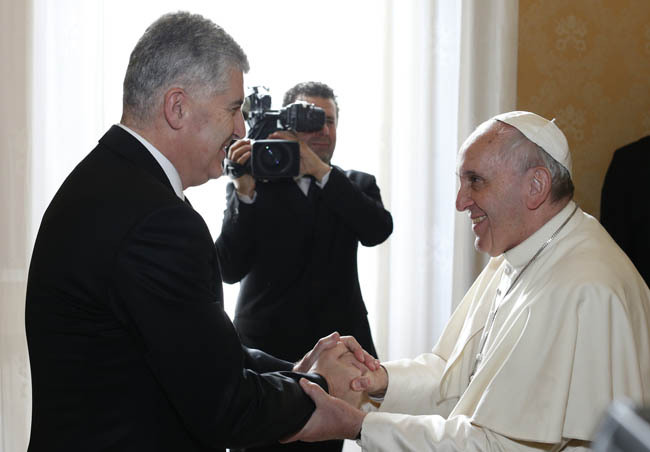 VATICAN CITY (CNS) — In an effort to help bolster a minority Catholic population and encourage dialogue and friendship among once-warring ethnic and religious communities, Pope Francis announced he would be visiting Bosnia-Herzegovina. The pope made the surprise announcement Feb. 1 after praying the Angelus with those present in St. Peter’s Square. It will be Pope Francis’ eighth trip abroad and the 11th country he visits outside of Italy since his election two years ago. The Balkan nation, which is struggling to rebuild itself after a devastating war marked by ethnic cleansing, is still largely divided along ethnic lines. Bosniaks make up 48 percent of the country’s nearly 4 million people, while Serbs make up 37 percent and Croats 14 percent. About 40 percent of all citizens are Muslim, 31 percent Orthodox and 15 percent Catholic. Although the 1995 Dayton Peace Accords ended the 1992-1995 war, the complex political structures the peace deal established meant the mostly Catholic Croat community became powerless and discrimination against them grew, according to Bosnia’s bishops.